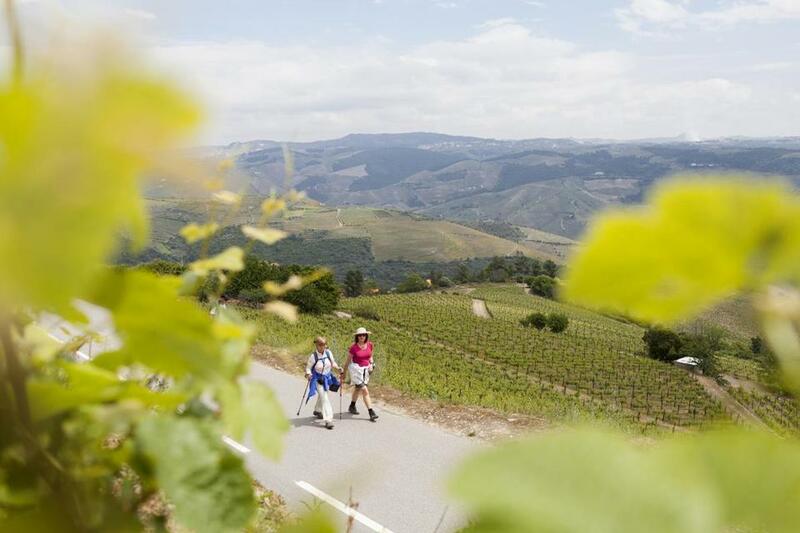 A pair of travelers get in a walk on a trip to Portugal. ORLANDO — Caught up by the movement, color, and music, visitors to Walt Disney World’s Epcot theme park barely seem to register how far they have to walk to get around the 1.2-mile perimeter of the centerpiece World Showcase Lagoon. A sudden shower sends a crowd of them sprinting for cover into a 360-degree theater tucked beneath a simulated mine, where they stand for the duration of an 18-minute panoramic look at the natural and cultural wonders of Canada. Then they climb the steps back out and resume their wandering from one gift shop and attraction to another. Of all the impressions people bring home with them from a sweaty, soggy trip to Disney World, there’s one that likely seldom makes the list: It was good for me. But a growing body of research shows that traveling — which even in its most comparatively unambitious forms is far more active than the sedentary routines many people follow in their daily lives — improves both physical and mental health. This isn’t just an anecdotal observation. Women who vacation at least twice a year have a much lower risk of heart attack or fatal coronary problems than women who vacation once every six years or less, the famous Framingham Heart Study has found. Men who take an annual vacation have a 30 percent lower risk of death from heart disease than men who don’t, according to research conducted at the State University of New York, Oswego. Separate studies by the American Psychological Association, University of Pittsburgh, and Marshfield Clinic in Wisconsin have concluded that vacationing helps lower blood pressure and depression and stress levels. Frequent vacationers report being 56 percent happier with their health and well-being than infrequent ones, the survey company GfK reports. Eighty-six percent are happy with their mood and outlook compared to 75 percent of non travelers, according to another survey, by the Global Commission on Aging, Transamerica Center for Retirement Studies, and US Travel Association. And 84 percent of managers say employees who vacation return to work more focused and creative; so pronounced is this effect that a Denver marketing company called Full Contact has started paying its employees $7,500 each to go on vacation. Until they’re asked, however, surprisingly few people — only about a third — have strongly recognized this connection between traveling for pleasure and improved health. Among their higher priorities for going on vacation, they list spending time with family and friends. There are signs these benefits are starting to sink in more broadly among travelers, especially at a time of unrelenting social and political anxiety. For one thing, people have started using more of their vacation days. After years of declining, the number of vacation days taken by the average American rose by half a day last year, to 17.2 days, according to the industry-funded Project: Time Off. That’s still far less than they’re entitled to, but up from a record low of 16 days in 2014. “Freedom from anxiety is a huge vacation in and of itself these days,” said Norman Howe, who quit his job as a lawyer to become president of the high-end active travel company Butterfield & Robinson. Often the health benefits of travel are unconscious. While its turkey legs and fast food may partly counteract the benefits of this, for instance, even a trip to Disney World can blow up a pedometer. The walking distance in its various theme parks totals 8½ miles, and that’s if you never double back to check if the line has gotten any shorter at Space Mountain. “I went there with my 6-year-old, and we definitely logged some steps,” said Katie Denis, vice president of and a researcher at Project: Time Off. It’s an example of how, while traveling, “We’re absolutely moving more,” said Denis. “You hear people say all the time, when they come back from their vacation, ‘I did all this stuff and I thought I ate too much but I ended up losing weight.’ ” And “getting away,” including from ubiquitous screens and cable news, means not just physically, but mentally. As travelers begin to notice this, so has the travel industry, which has started adding active and wellness options to everything from river cruises to African safaris. “It doesn’t have to be this incredibly active 30-mile bike ride every day. But where people might have been satisfied with sitting on a coach or a cruise ship, now they want to go on a hike and pick up the rocks,” said Tombaugh. Butterfield & Robinson next year will debut walking safaris in Tanzania and Zimbabwe, cycling and glacier-hiking excursions in New Zealand, and a walking tour of Jordan. In collaboration with Uniworld, it’s adding walking and cycling side trips to river cruises of the Seine and Danube; Tauck has also loaded bicycles and kayaks onto its European river cruise boats. With more travelers finding out they do like being active on vacation, providers in January formed the Wellness Tourism Association, which expects the market for this to reach $800 billion in annual sales by the end of this decade.